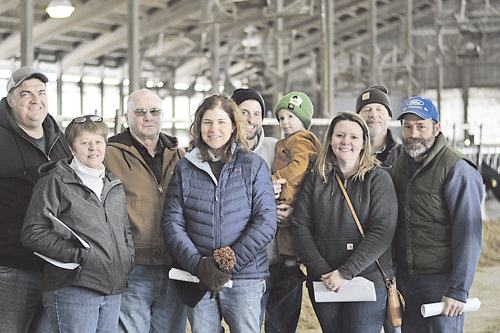 Members of the Otsego-Herkimer-Montgomery O-H-M Holstein Club of Central New York enjoyed a sunny day for their annual open barn/open house tour on March 9. 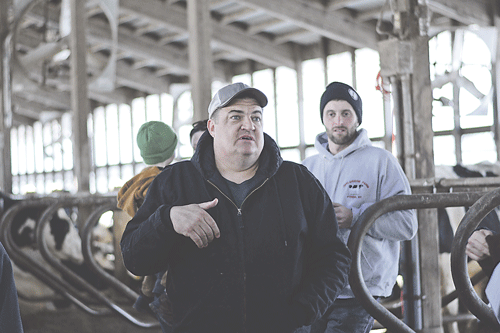 This year’s event was hosted by Kings-Ransom Farm, LLC in Schuylerville, NY, a fifth-generation dairy operation run by brothers Jeff and Jan King and their families. This was the first time the club visited a dairy operation with an on-farm business. Kings-Ransom Farm has an on-site milk production plant where they bottle milk for home and restaurant delivery sales. Their product offering includes 200 items ranging from milk bottled on site to fresh eggs and cultured products by other local farm producers. A newly built 3,000 square foot ice cream parlor and farm store will open this spring for customers to enjoy hard and soft ice cream while purchasing any of the products they offer through delivery services. The Kings milk 1,100 cows around the clock in a double 20 parlor built in 1972. Their herd average is 29,000 pounds of milk per cow per year. They also keep about 1200 heifers as embryo recipients and they sell 300 fresh cows a year. Jan’s wife, Pandora, is a bovine veterinarian and oversees all the herd health work for the farm. In addition to seeing the King’s on-site retail operation, members of the OHM Holstein Club were eager to learn about the farm’s embryo work. The King’s registered cattle have received top honors. In 2005, they were named the National Holstein Breeder Association’s Outstanding Young Breeder and at the 2018 New York State Fair they had three first place females. The Kings have been included on the Top 100 list of most influential breeders. “The Kings have a really good breeding program with their Cleavage and Cleo lines and it’s a great opportunity to learn about their work,” Menendez said. The farm’s breeding program is known internationally with buyers coming from Canada and across Europe to see the cows and purchase embryos. Embryo work is such an important part of the farm’s work that Boviteq spends two days onsite every two weeks doing embryo work. Despite the long hours and endless list of to-dos that come along with running a farm of this size, the Kings infuse humor into their cow naming process. “We try to have a little fun naming our cows. We had a mom named Don’t Ask and we named her daughter Don’t Tell,” Jeff said. Although the days are long and there’s a never-ending “to-do” list that goes along with running a farm this size, the Kings are always eager to greet visitors.